Continuity mistake: In the scene where the Snowman is in the snow plough and he is facing the large amount of snow but when he is stuck to the snow he has turned in the opposite direction. 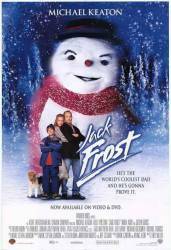 Continuity mistake: After Jack dies his son is making a snowman that later becomes his dad . You briefly see a scarf around the snowman. A little after that he puts the same scarf on the snowman.